The book introduces to the reader a number of cutting edge statistical methods which can e used for the analysis of genomic, proteomic and metabolomic data sets. In particular in the field of systems biology, researchers are trying to analyze as many data as possible in a given biological system (such as a cell or an organ). The appropriate statistical evaluation of these large scale data is critical for the correct interpretation and different experimental approaches require different approaches for the statistical analysis of these data. 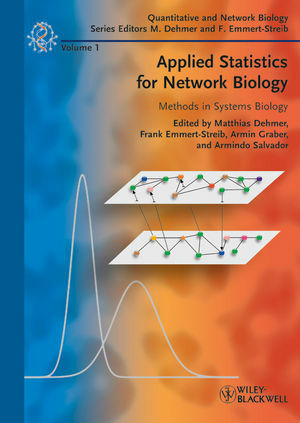 This book is written by biostatisticians and mathematicians but aimed as a valuable guide for the experimental researcher as well computational biologists who often lack an appropriate background in statistical analysis. Matthias Dehmer studied mathematics at the University of Siegen, Germany and received his PhD in computer science from the Technical University of Darmstadt. He began his academic career as a research fellow at Vienna Bio Center, Austria, and at Vienna University of Technology, and is currently a professor for bioinformatics and systems biology at UMIT - The Health and Life Sciences University. His research interests are in bioinformatics, systems biology, complex networks and statistics. In particular, Professor Dehmer is also working on machine learning-based methods to design new data analysis methods for solving problems in computational and systems biology. Frank Emmert-Streib studied physics at the University of Siegen, Germany, gaining his PhD in theoretical physics from the University of Bremen. He was a postdoctoral research associate at the Stowers Institute for Medical Research, Kansas City, USA, and a Senior Fellow at the University of Washington, Seattle, USA. Currently, he is a lecturer/assistant professor at the Queen's University Belfast, UK at the Center for Cancer Research and Cell Biology, heading the Computational Biology and Machine Learning Lab. His research interests are in the field of computational biology and biostatistics in the development and application of methods from statistics and machine learning for the analysis of high-throughput data from genomics and genetics experiments. Armindo Salvador studied biochemistry at the University of Lisbon, Portugal, where he received his PhD in theoretical biochemistry. He was a postdoctoral fellow at the University of Michigan, USA, and at the University of Coimbra, Portugal. He currently heads the Molecular Systems Biology Group at the Center for Neuroscience and Cell Biology, University of Coimbra, Portugal. Dr. Salvador's research interests are in the fields of molecular systems biology and computational biology. In particular, he is working toward clarifying the naturally evolved design principles of metabolic networks. Prior to joining Novartis Oncology in 2010, Armin Graber served as the CEO and Chancellor of the University for Health Sciences, Medical Informatics, and Technology (UMIT), in Hall, Austria, where he was also professor in the Department of Biomedical Sciences and Engineering. He has held various senior positions in biotechnology in the USA and Europe, including VP for Translational Research at BG Medicine, CEO of Biocrates life sciences AG, and Head of Bioinformatics in the Applied Biosystems Discovery Proteomics and Small Molecule Research Center. His research interests comprise targeted and non-targeted functional genomic technologies, and bioinformatic and biostatistic methods for biomarker discovery, validation and delivery.